I waited until the last day here, and it finds me sick in bed without a physical voice, but I wanted to take a moment to write and honor some very special people who loved Marin, its landscape artists and organic farming. My hope is that we can come together in 2015 and have a group show to give back to these special people, perhaps even start a memorial exhibit in their names that would continue to honor them year after year. 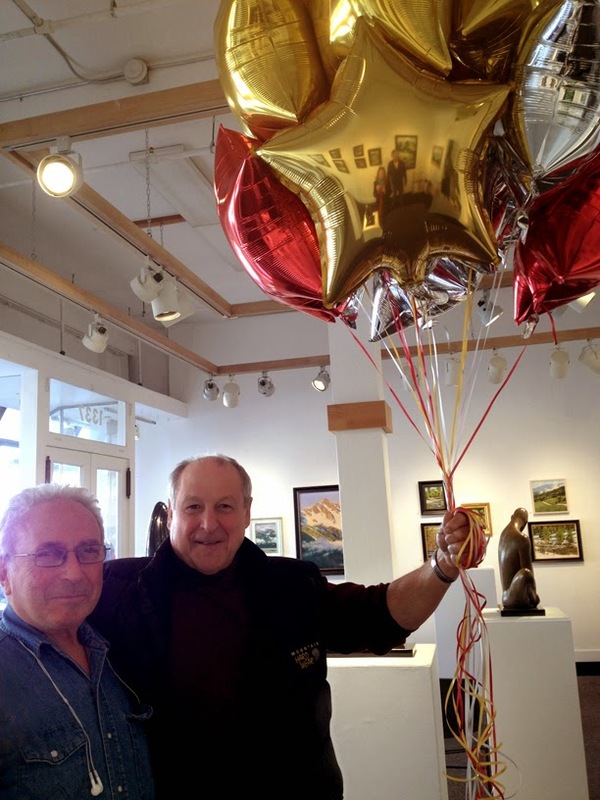 Sandy Greenblat was a compassionate force in the Arts in Marin County, and responsible for the reorganization of Art Works Downtown in his final years, where I assisted with graphics and PR. I was able to witness, first hand, this extraordinarily committed soul, sweep in and sort through, by hand, over fifteen years of clutter. According to the Marin Horse Council, where he was a volunteer for many years, his motto was to "always leave things better when you left", and he certainly did so for the Arts Community in San Rafael. He organized the entire office where I worked, and lead the Board in hiring it's current Executive Director. Sandy was kind to everyone. Above all, he wanted the staff to get along with each other, a task I can say was not always easy, but his encouragement certainly helped me stay as long as I could and accomplish many projects to improve the publicity of AWD. 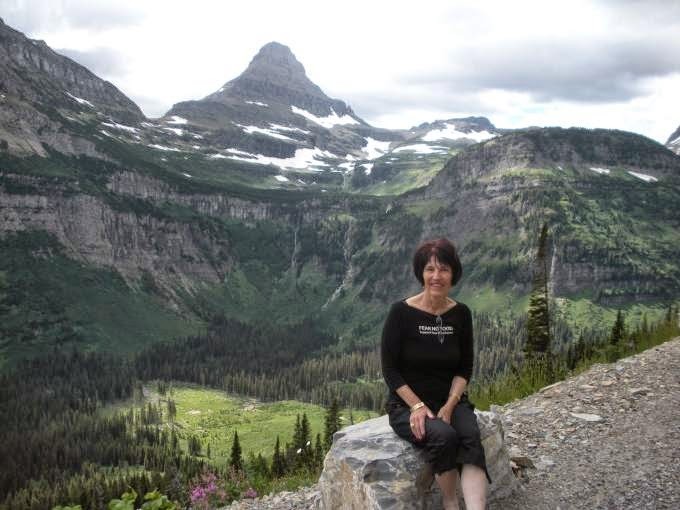 Sandy is survived by his wife, Artist, Marilyn Greenblat (pictured). During Sandy's role as the Interim Director, he and his wife, Marilyn Greenblat, an award winning landscape painter, worked to design the building wide exhibit of Art on the Farm that raised money for Marin Organic 2012-2013. A superb mediator and leader, Sandy was able to navigate the stormy waters of an Art Center situated in an old, historic building that had years of frustration based on building code changes and fundraising needs. In the end, a very large, collaboration took place, in which all areas of the building were filled with art about farming in Marin County. The Marin History Museum shared past artifacts and the artists in their studios benefited from the traffic stream of new people through the building and new cafe. 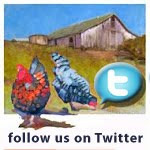 It was really a special exhibit for Art on the Farm, Marin Organic, and the community of San Rafael. We were very proud of that accomplishment, and it could not have been done with out the efforts of both Sandy and Marilyn. Sandy was a horseman, and when working with him, I learned that he truly enjoyed assisting in trail building in Samuel P. Taylor and really adored being with horses. His Facebook photo showed him in a cowboy hat, and I affectionately referred to him as the "Art Cowboy". When I left AWD, I gave Sandy a painting of two horses by artist Margaret "Patti" Elliot, a Marin Organic producer, photographer and painter. I always hoped he would have this for years to come and get to ride horses more often after AWD reorganized. I have spent this year, really thinking about Sandy's passion and commitment to the Arts, but also, his love of horses. 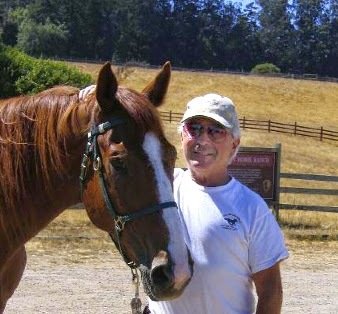 To read more about Sandy's amazing contributions to the Marin Horse Council, Trail Maps and more, please read the dedication to him in the Fall MHC newsletter here, or visit the Marin Horse Council website. I would like to propose that Art on the Farm artists come together and paint a series of horse paintings to exhibit in 2015. "The Horse Show" can become our way of giving back to Sandy. Perhaps we can find a way to include some of the horse non-profits in Marin. In the spirit of Sandy's volunteer work, please do volunteer to help with this goal in 2015, by contributing your time, your organizational skills and/or your art work. If you have a horse or friends with horses, see if there are ways we could bring artists to visit and paint/photograph horses, or get out to favorite horse trails for art involved with this goal. Click here to send a quick note of your commitment and wish to participate in the show. We also lost a very dear friend to Art on the Farm this Fall, rancher and producer at Point Reyes Vineyard, Sharon Doughty. Sharon was an amazing woman. I will never forget her voice on the phone when I would call to schedule an outing. "What do you need? and "Yes, we can do that" Were always her answers. 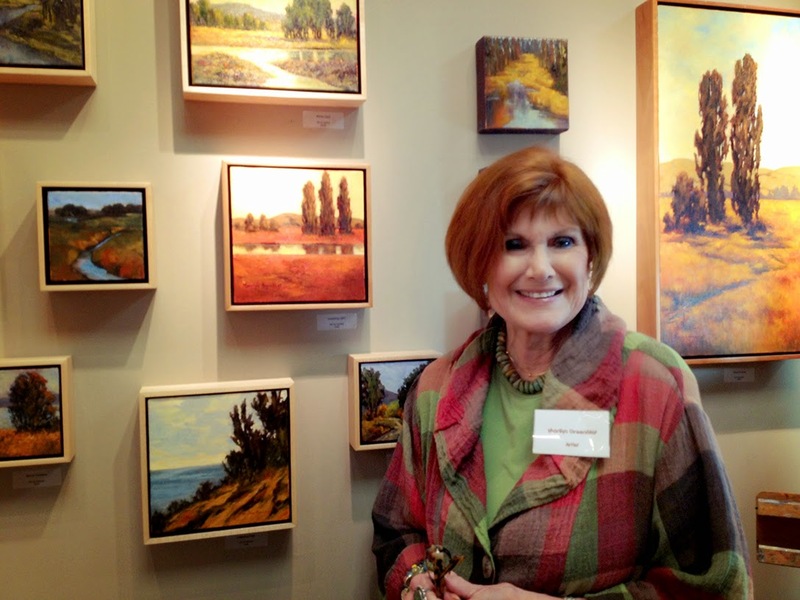 She was so incredibly willing to help get artists out to enjoy West Marin that she and Steve hosted the Art on the Farm group at their vineyard and inns for several years. Many of the Art on the Farm artists got to know them personally and really loved our annual show at the Vineyard where we displayed some of the art on hay bales. When the weather was in climate and rainy for two years in a row, this unique outdoor venue was scratched, but we all benefited from some wonderful events there. Our group has never had a budget and always allowed all artists to participate for free, so the ability to rent a space or put up tents was never really something we wanted to do- we were trying to sell art and raise funds simply, not spend money. Sharon and Steve offered their summer cabin on Tomales Bay to us once a year for the artist to paint on the Bay. These amazing contributions from Sharon were always done with out question. The more people, the merrier. She never got frazzled or lost her cool. I am sorry I did not get to visit her one more time. I would like to pass on one of my paintings of her property to the family, and I welcome other artists from Art on the Farm to do the same. 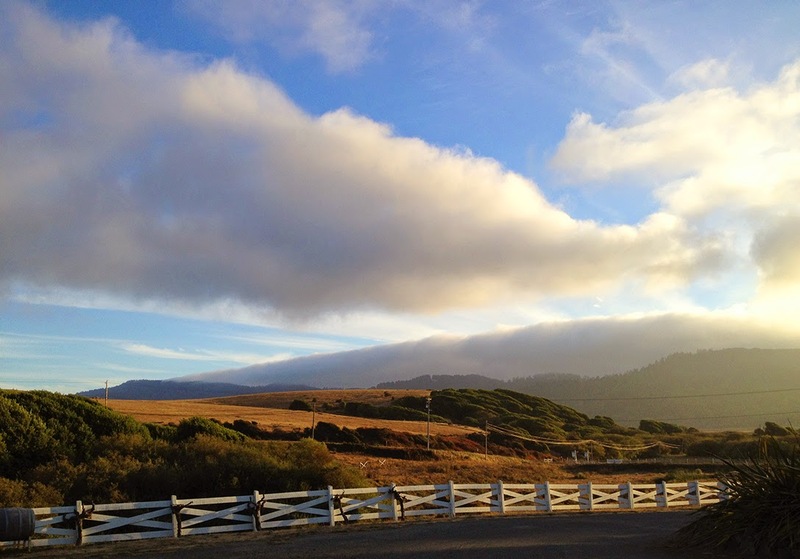 So, as we move forward into 2015, I want to embrace Sandy's wish that "we all need to get along" as artists in Marin County, and Sharon's wish that "everyone is welcome" to enjoy the land that is West Marin and cherish it, preserve it and give back to Marin Organic and MALT. As we say goodbye to 2014, Sandy and Sharon, I ask that everyone who has benefited from their work and kindness give what they can now. Don't put it off. Sandy and Sharon did not put things off... they helped right away, whenever they could. You can do this right now by making a donation to Marin Organic, volunteering, or visiting Pt. Reyes Vineyards and telling the family "Thank you".